This page introduces the rules of Go. These rules allow you to quickly start playing your first game. Go is played by two players, called Black and White. 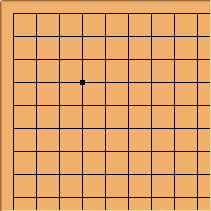 The Go board is a grid of horizontal and vertical lines, as shown below. The standard size of the board is 19x19. Other board sizes such as 9x9 or 13x13 are also played, usually by beginners or players who desire shorter games. On this page, examples are shown on a 5x5 board, which is small compared to the sizes players normally use. The size of the board does not affect the rules. The lines of the board have intersections wherever they cross or touch each other. Each intersection is called a point. Intersections at the four corners and the edges of the board are also called a point. 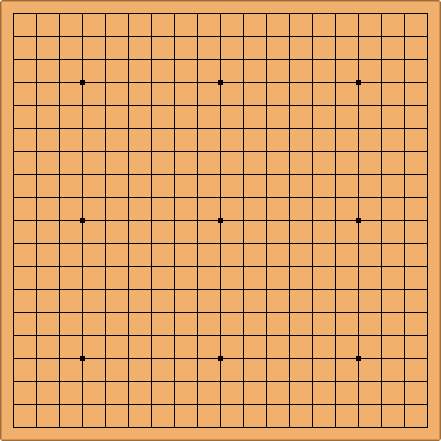 Go is played on the points of the board, not on the squares. The example board has 25 points. The red circle indicates a point near the center of the board. The red square indicates a point at one of the corners. Two points connected by a line segment are said to be adjacent or next to each other. Stones that are all adjacent to one another are called a string. The two white stones in this diagram are adjacent to each other and are a string. The two black stones are not adjacent to each other. Black uses black stones ( ). White uses white stones ( ). The example shows a game position with 4 black stones and 3 white stones. The points on which any stone is put are called occupied. All other points are called unoccupied or empty. You do not need to use Go stones to play Go. You can play Go using whatever you have, such as poker chips, beads, buttons, coins, etc. Additionally, you can play Go on paper by drawing a grid and marking O's and X's on the intersections as you play. The player having the turn puts one of their stones on an empty point. White plays a stone at . Sometimes, to complete a move, a player removes stones from the board. Sometimes there are points that may not be played on a particular turn. A player may also pass instead of playing a stone on their turn. A game of Go starts with an empty board and Black plays first, unless playing with handicap. In the example Black chooses to start at the point . If one player has more experience than the other, the players may play with a handicap, meaning the less experienced player holds the black stones and starts with a few stones already on the board. Handicap makes Go more enjoyable for the players with some difference of ability. The capture rule: If a player surrounds an opposing stone or stones by playing on all adjacent points, the stone or stones are captured and are removed from the board. Every stone or string of stones must have at least one adjacent point that is unoccupied. This unoccupied point is called a liberty. Adjacent stones in a string share liberties, and the stones are said to have liberties. If there are no empty points next to a stone or a string of stones (i.e. no liberties), the stones are removed from the board. The white stone is almost surrounded. It is adjacent to only one unoccupied point, shown by the square. Thus, the stone has only one liberty. Remember: only adjacent points can be liberties. So the circled points do not count as liberties. The three white stones are adjacent to one another and share liberties. As a string, the stones stand or fall together. Black's move occupies their last liberty and captures them, removing them from the board. A move can also surround different stones at the same time even if not all of them are connected as a string. Black's move captures the surrounded five white stones. For this Black occupies the last liberty of the four white stones at the top which is also the last liberty of the one white stone in the middle. All the white stones without liberties are captured and thus are removed. The White move occupies the last liberty of the two black stones, and removes them. When capturing, it does not matter that temporarily the capturing stone does not have a liberty. This is because, after the captured stones are removed from the board, all stones on the board have at least one liberty again, leaving a legal position. The repetition rule: One may not play a move that repeats a previous board position. This rule prevents players from endlessly capturing and recapturing a stone, back and forth. White's move removes a stone. Black's move would remove the stone . However, would also repeat an earlier position - the position just before . Since the rule prohibits repetition of the board position, Black cannot play at now in the example. Black must play on a different point. Note that on subsequent turns, the same move may be available as a legal move, because it will not be repeating the same board position. For more on this rule, see ko. The situation where repeating captures of the same stones would be possible without a special rule is called a ko; ko fights can be one of the most exciting parts of the game. The victory rule: The player who occupies (controls or surrounds) the most points wins the game. When neither player wants to keep putting stones on the board, they will each pass. (Passing is always a legal move, although it is only good at the end of the game!) The player who controls more of the board wins. There are two ways to score, area scoring (also called Chinese rules) and territory scoring (also called Japanese rules). Both systems count territory, the number of unoccupied points surrounded by one player's stones, but they differ in how the stones are counted. In either case, each player gets a total score and whoever has the larger score wins the game. For the vast majority of positions, the two systems give the same difference of scores and give the same winner. In area scoring, the score is territory plus the number stones the player has left on the board. In territory scoring, the score is territory minus the number of stones the opponent has captured. The example below uses area scoring. In this position, Black controls 6 points of territory and has 7 points occupied by black stones. Thus, Black has a total of 13 points. Meanwhile, White controls 5 points of territory and has 7 points occupied by white stones. Thus, White has a total of 12 points. In the example, Black controls more points. Therefore, Black wins the game. That's it! Now you can play Go. A more subtle understanding of the rules of Go will not help you play Go better. There are several minor variations to the rules of Go worldwide, but it is quite rare for these variations to affect play. Most of the confusions that a beginner faces are not about how to play, but about how to play well.